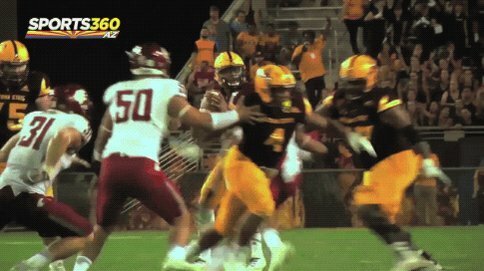 There’s a new era of football in the Valley as the Arizona Hotshots notched their first win in the Alliance of American Football’s opening weekend. The Hotshots defeated Dennis Erickson and the Salt Lake Stampede 38-22. In front of a reported crowd of 15,000, quarterback John Wolford threw for 275 yards and four touchdowns. Former Sun Devil Rashad Ross led all receivers with 103 yards on five receptions and two touchdowns. The ‘Shots also forced three turnovers without giving up the ball. There were plenty of open seats at Sun Devil Stadium, but the fans that were there were decked out in Hotshots gear and many seemed bought in before the franchise had taken the field for the first time. Armed with their battlecry of “Shots” by LMFAO and Lil’ Jon on every scoring play, the crowd made its presence felt.